A Japanese asteroid probe is a step closer to coming home ?possibly with a piece of space rock on board ? after firing its thrusters tostay on course for a planned June 13 landing. 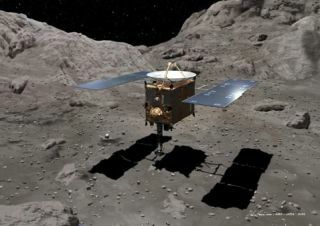 The probe, called Hayabusa, launched by the Japan AerospaceExploration Agency (JAXA) in May 2003, is returning from the nearby asteroid25143 Itokawa, where it landed and tried to collect samples. The beleagueredprobe reached the asteroid in 2005, but has suffered several malfunctionsduring flight that have extended its mission nearly three years longer thanplanned. Mission scientists aren't even sure if Hayabusa managed tocollect samples on Itokawa (its projectile device designed to kick up dustfailed to fire properly) but they still hope the probe managed to snag at leastsome asteroiddust and pebbles inside a collection canister. The 950-pound (430-kg) spacecraft's sample return capsule isscheduled to land back on Earth June 13 at the WoomeraTest Range in the desert of South Australia. In the recent maneuver (called a TCM-3 operation), JAXA wasable to shift the probe's path from Earth's outer rim toward its intended landingsite in Australia. The spacecraft is currently about 3.6 million kilometers(2.2 million miles) away from Earth. The move went successfully, which was a nice break for the spacecraftafter the long string of engineering difficulties it has suffered since leavingits asteroid target. Those glitches include engine problems, a leakingthruster, broken reaction wheels, and a loss of communication with the ground. Allseems to be on track now for landing, though. "Hayabusa system is going well," JAXA said in astatement. One more trajectory correction maneuver is scheduled forlater this week to further refine Hayabusa's Earthward approach. Hayabusa, which means "Falcon" in Japanese, tookextensive observations on and around the Itokawaasteroid, where it lingered for about three months during the originalscience mission. That information, and the possible samples it might becarrying, should help scientists understand how asteroids formed and the rolethey played in the history of our solar system.